Exceptional Sea-Front design Condo, Private Garden across from Beach! At few minutes walk to shopping, restaurants, museums, Old Town and the historical Hotel Negresco. * Light, bright, contemporary and modern, garden level condo with teak terrace and large awning. 5 minutes from shopping and restaurants. 10 minutes from airport/heliport and train. HALF A MINUTE FROM THE BEACH AND ACTIVITIES! This is a beautifully renovated, upscale, and state-of-the-art condo. Plus, you will enjoy the private garden and the sea views. The location is ideal and is in the best area along the famous Promenade des Anglais! Air conditioning, Concierge. The Stellamar is a listed Art Déco building and it has history! Grace Kelly lived here when she met Prince Rainier of Monaco in 1955! Bathtub, Italian Shower, French Basin. Wood teak floor, and designer accessories. On request, 150 meters away, for an additional charge. Add 25 Euros per full day. Garden level with your private garden! Convertible sofa, up and down table, access to the terrace and garden, TV Sat-Home cinema, Internet. Coffee, Expresso and Cappuccino maker. Coffee, teas, condiments, and linens. Up and down table in the living space, counter on the kitchen, and table and chairs with bench in the garden. Private Patio and garden facing beach. 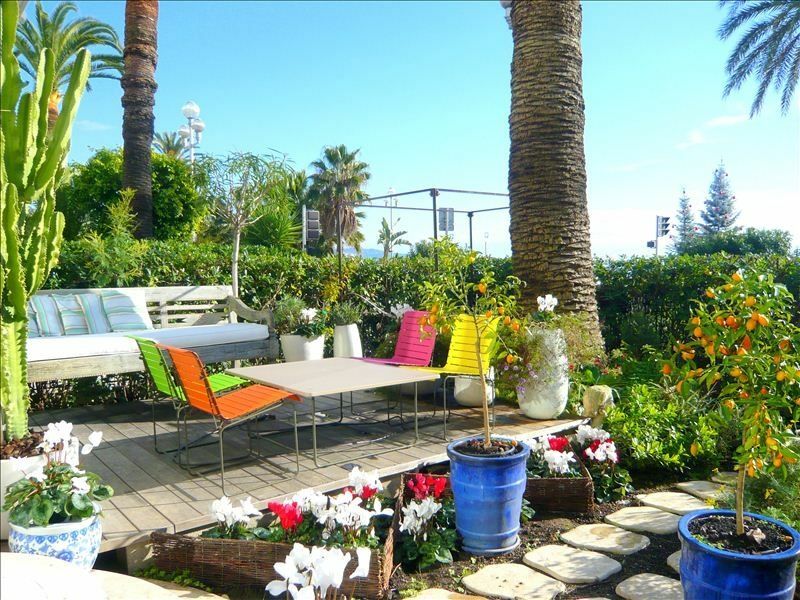 Great location for that perfect vacation on the French and Italian Riviera! We just came back from a two-week stay at this condo. The location is perfect! It made for a great home base for day trips to Cannes, Cap d'Antibes, Cap Ferrat, Eze, Monaco, Gourdon, Tourettes-sur-Loup, and Sanremo. The condo has a wonderful private garden which had lots of white cyclamen flowers in bloom along with palm trees and potted plants. And the view of the Mediterranean Sea just beyond the hedge was spectacular! The condo itself was well stocked with every kitchen appliance imaginable, from a gas-fired wok to a built-in espresso machine. The Carrefours Grocery is just around the corner, and there is a great boulangerie/patisserie within a block and a half which is open 7 days a week. The condo is on the bus line and it has great security! The tram is also being extended from the Nice Airport to Old Town and will be open in 2017. That tram line will run one block behind the condo. You can't find a better place! This apartment was even better than the pictures and description. We arrived in the evening and were cheerfully met by the owner, Richard, who explained everything in great detail. When we had questions, he was readily available to help us. The apartment was clean, bright and modern with a very functional kitchen-we cooked some of our dinners at home after shopping in the outdoor markets and had everything we needed to produce and serve full meals. The flower filled patio was perfect for coffee in the morning and cocktails in the evening. The location is near everything and right across from the lively promenade along the Mediterranean. The street in front of the apartment is busy well into the night so leaving doors open for fresh air is not an option but the air conditioning keeps you cool on warm nights. Day trips to Antibes, Cannes, St. Paul and others are a short drive away. I would definitely recommend this apartment and would return to it if we travel to the south of France again!